NIC Components is pleased to announce the expansion of the snap-in aluminum electrolytic capacitor product line with the new Extended lifetime NRLLW series. The NRLLW exceeds the current lineup of NIC's 11 other snap-in series (NRLx family) series with extended lifetime ratings and reduced height options. The NRLLW series is supported in capacitance values from 120uF to 560uF, with voltage ratings of 400VDC, 420VDC and 450VDC, with operating temperature range of -25°C to +105°C. The NRLLW Series meets PB-Free soldering conditions and is RoHS Compliant without exemptions, halogen free and REACH SVHC 168 compliant. Contact NIC Components today for samples and to review your circuit requirements. 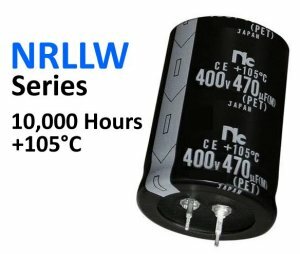 The NRLLW series features load life rating of 10,000 hours at +105°C (life test equivalent to 40,000 hours at +85°C and 160,000 hours @ +65°C) making it ideally suited for use in high voltage - long life power supplies, industrial equipment, lighting ballast, inverters, smart metering and green power applications. Another advantage of NRLLW series is support in reduced component case sizes, with diameters of 20mm to 35mm and component heights from 25mm to 50mm (i.e. typically 5mm to 15mm lower profile than most competitors’ products). The NRLLW series is suggested for use with other NIC series which include the NPX and NPY safety capacitors and NPIM_P high current power inductors.